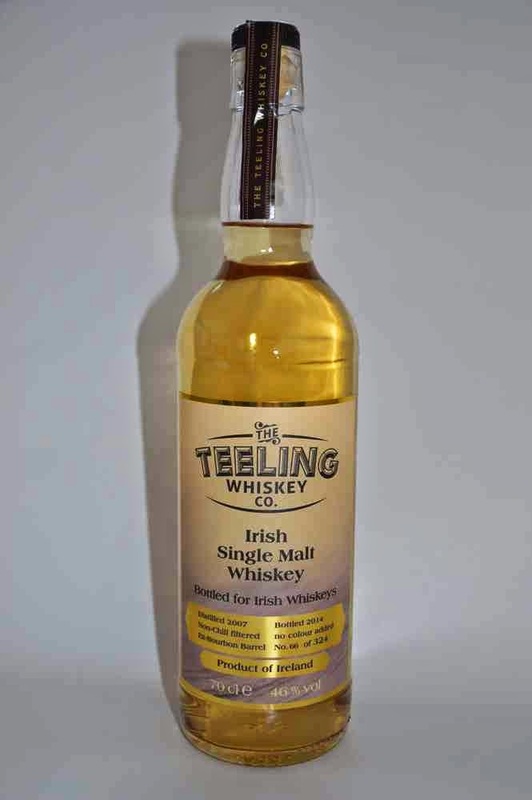 I wrote yesterday about a "new" Teeling single cask, single malt whiskey bottled exclusively for Irish Whiskeys, an online retailer in Germany. I slipped up a bit there because that was, in fact, released last year. I didn't document it then so better late than never. What I should have been writing about is their actually new, just released, single cask, single malt Teeling. It was double-distilled in 2007 and matured in an ex-bourbon cask until 2014. Mareike Spitzer, the company founder, selected the cask herself. 324 bottles have been produced, at 46%, without chill-filtering or colouring. It sells for €49. Wood, apricot, marzipan, apple, cream. Wood, vanilla, citrus, oily, fruit. Very long with intense woody notes.